This decision is on our appeal of the lower court decision to deny our motion to dismiss the case. 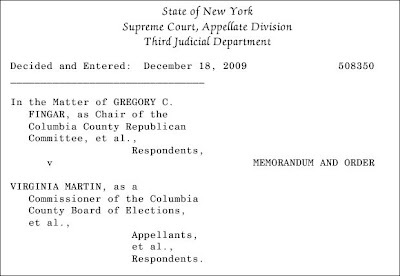 While the court affirmed the lower court decision which says that the Republican's cause of action states a claim, the court agreed with our position that they cannot challenge residency after the absentee ballots have been issued; that the law regarding a voter choosing among residences for election purposes is construed broadly and that the failure by Fingar and the Republican Party to join the voters as necessary parties means they did not intend to challenge them on the basis of residency. Following is the Press Release on the ruling issued by Chris Nolan, Chair of the Columbia County Democratic Committee. Today, the Appellate Division of the NYS Court sided with the Columbia County Democratic Committee in upholding second-home owners' right to choose from which residence to vote. In issuing its decision, the Court threw out all Republican challenges based on absentee voters’ dual residency, finding that such challenges may not be made after a ballot has already been issued. The case survives only as to those challenges that were not being contested in this appeal. This important decision validates the rigorous defense of dual residents’ voting rights made by our attorney, Kathleen O'Keefe and Commissioner Martin’s attorney, Dan Burstein. We are pleased that this issue has now been settled and that the court yet again has recognized the voting rights of second-home owners. This pro-voter decision makes it clear that the voter suppression tactics used by the Republican Party in this case are not permitted. and it is still not over.